We would like to assist you in your search for a suitable room. The student accommodations vary in location, type of living arrangement, size and price. We also offer barrier-free rooms and apartments for mothers/fathers with child. All you need to do is fill out the online application form. You do not need to attach a certificate of enrollment. 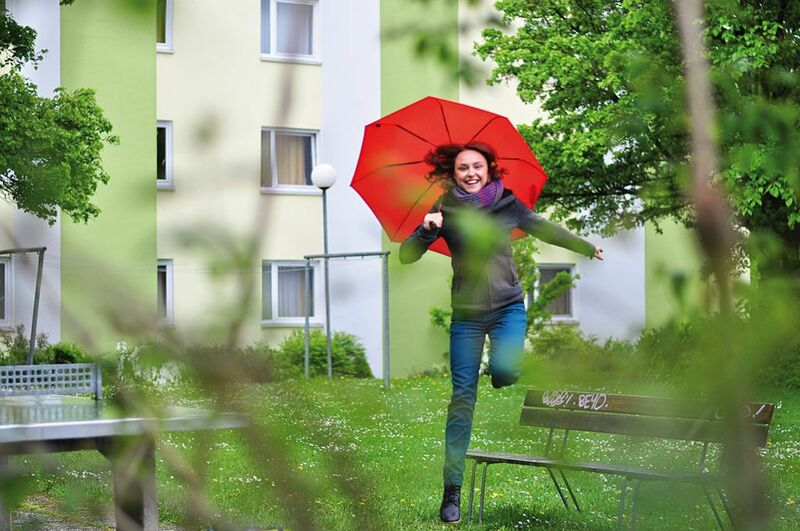 For student residence places in Aalen, please contact the Jugendwerk Aalen. There are usually rooms vacant until just before the summer semester starts. In autumn, however, it sometimes happens that all rooms are taken before the beginning of the winter semester. If that is the case, you might face a waiting time of up to several months. Longer waiting times may occur for apartments. We recommend that you apply early. If we have a room available for you, we will inform you as soon as possible before your desired date of moving in. If you haven't heard from us about 3 weeks before this date, you can assume that no room is available for this date. However, your application will be kept on the waiting list. There are no particular application periods or deadlines. The sooner you apply, the better. Vary depending on the student residence. We offer single rooms in double units (accommodation shared between 2 people), in 3-people up to 6-people units and in group homes (e.g. 18 students share a kitchen and sometimes sanitary facilities) as well as several apartments. Depending on the student residence and living arrangements, the rooms range from 10 m² to 20 m². You always have a room to yourself. You will share a kitchen and usually also shower and toilet with one or more students, unless you live in an apartment. Internet connection: Every room has internet access. The costs are included in the rent. Landlines: If you want your own landline, please arrange this with your landlord directly. All our student residences are well-connected to public Transport. Rent prices include all utilities. A one-off service fee of €20 is charged when the contract is signed. The bond of €300 ensures that potential damages are covered. The only available termination dates for any rental agreements are 30th March and 29th September. The termination notice must be submitted in writing 8 weeks before the above-mentioned dates at the latest. The maximum rental duration is 6 semesters. If 6 semesters are not enough, please contact us. The bond is the same amount (€300) for all rental agreements. After you move out, you will receive your bond back on the condition that your room meets all end-of-lease requirements. Furnishing: Most rooms come with basic furniture: wardrobe, bed, table, chair, mobile drawer cabinet. Depending on the student residence, you will have a sink or your own bathroom. The bed comes with a mattress. Due to hygiene, students are required to bring their own bedding including pillow, blanket etc. Tableware, cutlery and cooking utensils are not supplied. Especially our residence in Gutenbergstraße has apartments for single mothers or fathers. Please do not hesitate to get in touch. The student residence in Manfred-Börner-Straße has one room that is adapted for a student with hearing impairment, including a bell with an additional light Signal. If you haven't been able find a room in our student residences nor through the private room register, we recommend that you come to Ulm for a few days to search on the spot. The Mi(e)twohnzentrale is an agency for temporary accommodation including rooms up to entire apartments that are available to rent for three weeks up to several months. Please note that a commission will be charged.